It's not stalking if you have a licence: Why me? For those of you unfamiliar with this term, it is in reference to someone who, with no real intention of procuring your goods or services, will waste a great deal of your time and energy sounding you out in order to obtain as much free advice as possible. You may recall, I actually started this blog over a year ago after receiving this sort of run-around from The Crack Whore - Part 1 (Part 2 and Part 3). As with Gladys (not her real name), pictured. Well, seeing that I've not actually met her in person, this is a close approximation of her appearance cleverly deduced from our recent phone conversations. I first received a call from Gladys a couple of weeks ago where she explained that she wanted to "get the dirt on" her former husband who had recently been threatening to kill her. She then explained that he'd raped her on a number of prior occasions and also raped his stepdaughter from a prior relationship when she was 9 or so (now an adult). She had a log of his threatening calls to her and wanted to take action. Fairly serious allegations but I couldn't help wondering why, with all these details and supposedly a sworn Affidavit from the step-daughter, Gladys needed more 'dirt' on him? Surely she should, along with the stepdaughter, be off making a complaint even if the events were historic? 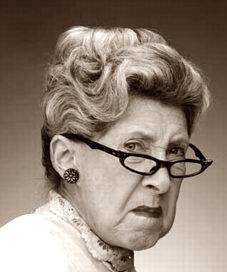 However, knowing that there is often more to a prospective client's story than first meets the eye, I suggested a face-to-face meeting with Gladys in order to discuss the matter in greater detail and, ultimately, to determine if there was anything for me to actually do - or whether Gladys would be better suited dealing with another agency such as the Police? Gladys seemed keen enough. I suspect that I was not the first person she'd called, but might have been the first to at least give her the time of day. We made an arrangement to meet in several days time at a particular cafe that was convenient for her. Gladys said I'd have to buy her a coffee as she didn't have any money. Well, obviously there were some alarm bells ringing at that point but I have no problem with a no-obligation meeting with a prospective client. Maybe Gladys was merely being coy about her financial situation as a ploy to keep the costs down. On the day of the scheduled meeting, Gladys calls saying that she couldn't make it and asked to reschedule. Sure, I said. We rescheduled for a few days later. These things happen. A few days later Gladys called once again asking to shift the date and location. That's fine, no problems. And today, some 15 minutes before the meeting and while already at the location, I decided to give Gladys a quick call to ensure that everything was good. Well, no, Gladys couldn't make it and would I terribly mind if we rescheduled to the same day next week thank you very much? No Gladys, why would I mind changing my schedule around at your whim, again, when you don't have the courtesy to even tell me you are not going to attend a meeting that I had to go to some lengths out of my way to attend? I mean, it's not like you're asking for my help and most likely expecting me to do most of the work at little to no cost to yourself, right? Actually, isn't that exactly what you are doing? I've taken Gladys out of my calendar and won't bother calling her again but am left wondering how best to avoid this type of timewaster again in the future? Is it even possible? Obviously not only Private Investigators of good standing, such as myself, are open to this horrendous abuse of our generous natures, but it is rife in other industries. Here is an interesting piece on the phenomenon from the perspective of a design agency. But it's a cold sort of comfort. Love this blog, always makes me realize my circumstances could be worse. Gladys never called back. I didn't bother turning up.